I have a tendency to announce "I hate all my clothes!" This is generally 75% true, as I've got favorite jeans or tank tops or what have you. The problem, besides having nothing to wear, is that I fall into a vicious cycle of hating my clothes, then going shopping, then hating my new clothes because I thought I needed to try "something different." Dressing room mirrors and indecisive brains can trick you. I've never been particularly stylish. Throw in a post-pregnancy body and there's all kinds of confusion. Yesterday I sorted out all my clothes to keep vs giveaway. I love the eyelet details and the slight girliness of this tunic dress from Old Navy, but frankly I look like a washed out zombie wearing it. Instead of giving it away I thought I would try dying it. 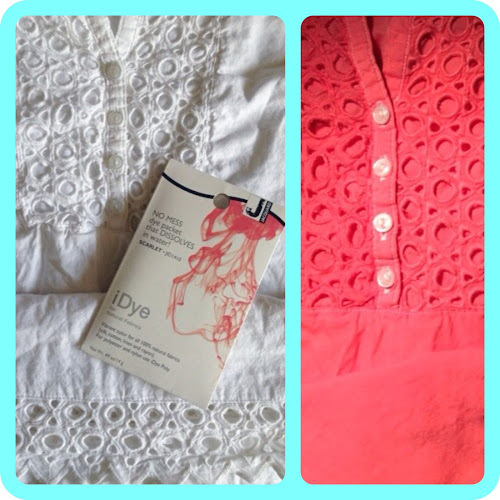 This dye is easy to use since you just throw it in your washing machine (we dyed a couch cover this way, too). That doesn't mean you don't have to be careful...I do have a newly pink hand towel now. The color came out much brighter and pinker than I expected, so we'll see how long it lasts in my wardrobe. I'll most likely layer it with jeans...is that a fashion faux pas? Because the tomboy in me prefers that look. Anyway, here's to experiments and working with what you've got.